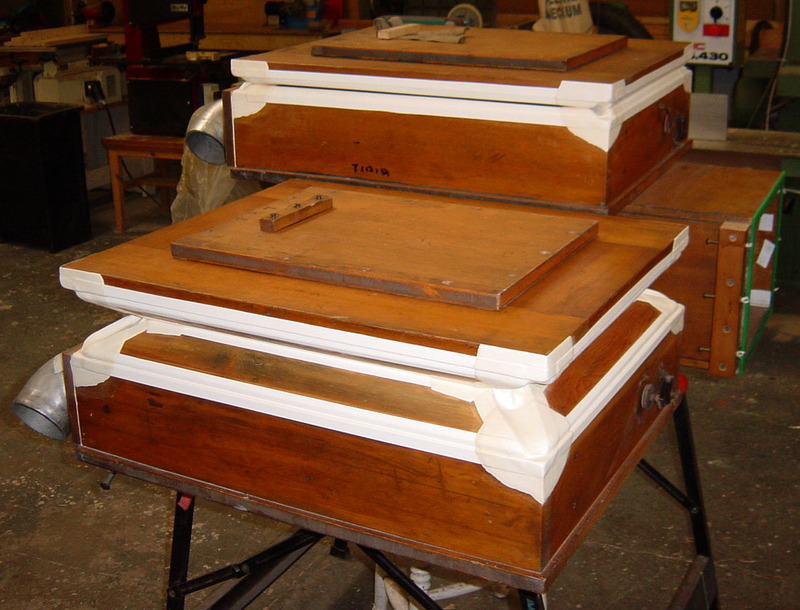 We also undertake all work associated with cinema and theatre organs. 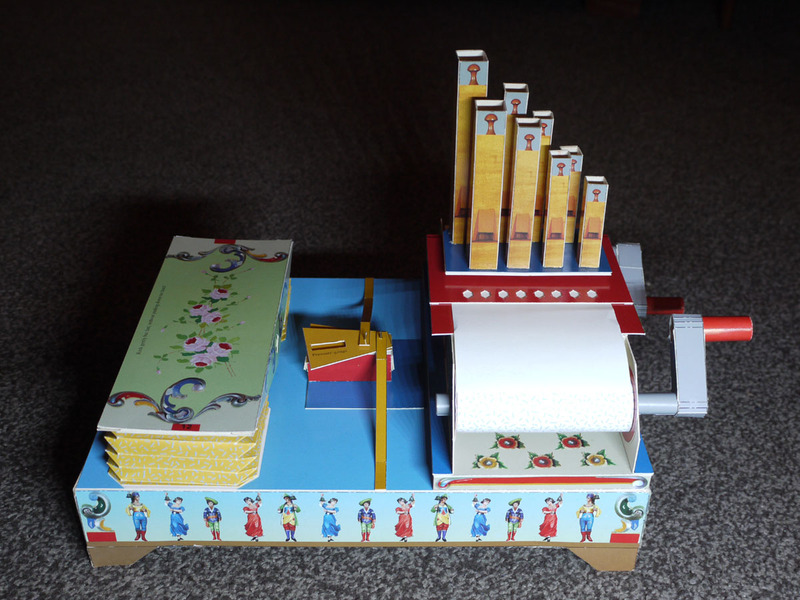 This is not as surprising as it may at first appear, as this type of instrument is also aimed at entertaining the public, just as mechanical organs are. 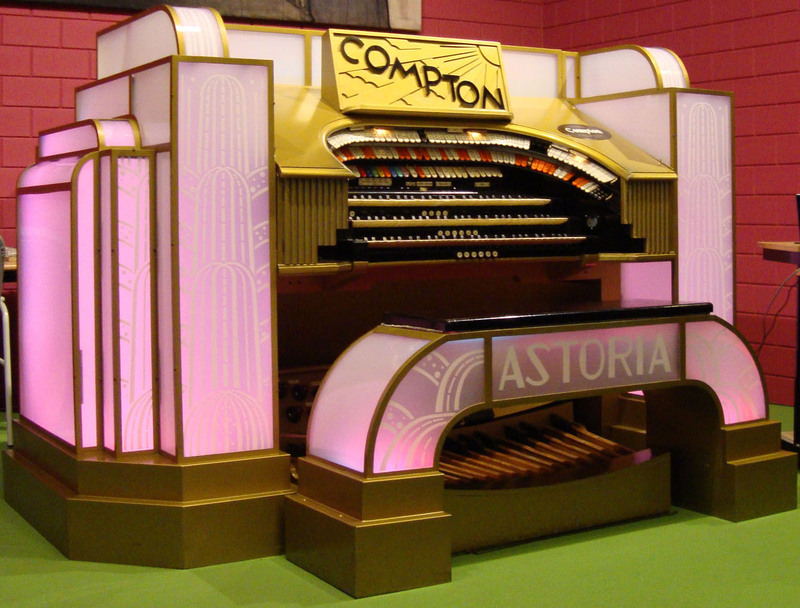 This is the console of the 3-manual, 9-rank cinema organ built in 1934 by the John Compton Organ Co. Ltd. of London for the Astoria Cinema, Hull. The entire instrument was overhauled and installed by us in a private collection in the Netherlands a few years ago. The instrument was equipped with a Uniflex 3000 control system, the first to be fitted in Europe. Like most mechanical organs, cinema and theatre organs operate on a higher wind pressure than is generally found in other manually-played organs. They often include additional instruments such as glockenspiel, xylophone, marimba, vibraphone and tubular bells, as well as a comprehensive range of percussion, such as bass and snare drums, tambourine, castanets, cymbals, triangle, tom-tom, wood block, etc., making them close relations to self-playing organs. 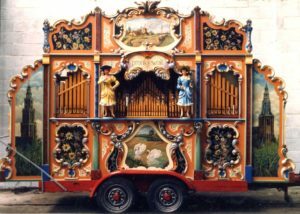 Indeed, one of the most important manufacturers in the cinema organ world, the Rudolph Wurlitzer Co. was also a major manufacturer of automatic musical instruments, and had ties with European mechanical organ building stretching back to the 1890s. We can remove, completely restore and re-install organs anywhere, but we are also happy to re-leather chests, regulators, tremulants, percussions etc. as required. We undertake tuning, regular maintenance, regulating, voicing, appraisal etc. and can even supply complete organs, restored and installed. Two regulators from a Compton theatre organ are seen here after re-leathering. We are pleased to supply and install the famous Uniflex Organ Control System offering over 30 years of tried and tested reliability and many unique features for the organist. 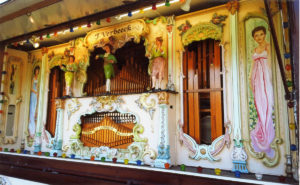 A record and playback feature allows the organ to be demonstrated at any time, even if an organist is unavailable, which is an essential feature for instruments located in museums and visitor attractions. Watch out for more news on the Uniflex Organ Control System coming soon!